← Shame on Oakmont Senior Living? Big 5’s normal hours of operation is 10 a.m. to 9 p.m. So why is a store that is supposed to open at 10 a.m. opening so early every Friday and sometimes as early as 8:30 a.m.? Big’s 5 weekly delivery of ammo! Since Obama & Feinstein have launched their gun control stance and threaten new tighter laws on restricting firearms and ammo sales, there have been a few unexpected side effects. Gun store shelves were immediately cleaned out cleared out after the statements from President Obama and Senator Feinstein about gun control. Those going in to purchase firearms, found holes inventory and bare shelves. The high demand left online retailers and storefronts either sold out completely or charging outrageous prices for what little inventory is left. This is true for both firearms and ammo sales. Big 5’s best sellers are the Bucket of Bullets which hold 1400 rounds of .22LR that sell out instantly and usually go to the first one or two, and occasionally a lucky third in line on Friday mornings. The run on ammo is so extreme that Big’s 5 has created a special store policy limiting purchases to a 5 box maximum per person. Aside from the rationing of ammunition, the gun control talk has also made finding 9mm, .40 caliber , .22LR, and .223 rounds very hard. The National Rifle Association‘s member ranks have grown by 100,000 in a week after talks of gun control legislation from the White House after the December school shooting in Newtown, Conn. according to the Huffington Post. An American non-profit organization (Oathkeepers) that advocates that its members (current and former U.S. military and law enforcement) disobey any orders that they are given if they believe they violate the Constitution of the United States has made their stance known. In response to Sandy Hook, Oathkeepers, has continued to offered free weapons training to any teacher across the U.S. (including the Bay Area) that want to learn how to protect themselves and their children. In the weeks after the shooting, Fox News reported that the NRA was claiming an average of 8,000 new members a day which is still occurring 14 16 weeks later! However, the NRA isn’t the only business being affected. According to the Operations Manager for United Sportsman’s Gun Range (located on Evora Rd in Concord), they too have seen a high influx of new shooters and those going in for continued training. Even the local gunsmith, Trinity Gun Smithing (in Antioch) is reporting that they have seen an “surge” in people wanting to get their old broken guns oiled and firing again. Protests have been the norm across the country as the gun control debate rages on. 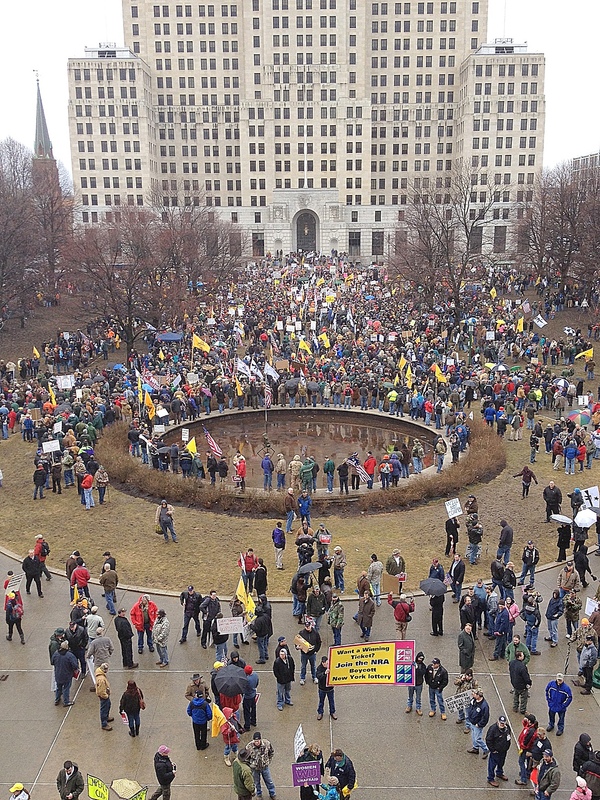 In New York on February 28, several thousand people, mostly white men, many dressed in hunting outfits and carrying American flags, filled the one square block park outside the Capitol. They expressed their anger against the recently enacted toughest in the nation gun control laws championed by Governor Cuomo and approved by the majority of state legislators. Protestors chanted “We will not comply” and “Cuomo must go” and most stated loudly and publicly that they would not obey provisions that will require them to register more types of guns and they encouraged others to do the same. Leaving it to enterprising Americans to always find a loophole in the midst of ever-expanding government regulation, the government’s gun buyback program has since turned into a gun shows, all across the nation. While thousands of residents lined up for hours to trade in their handguns, rifles and family heirlooms away in exchange for up to $100 in gift cards as part of the government’s latest gun buyback program; gun collectors who have seen prices for so-called “assault weapons” and firearms accessories almost triple since November took advantage of a huge opportunity to out bid the police. 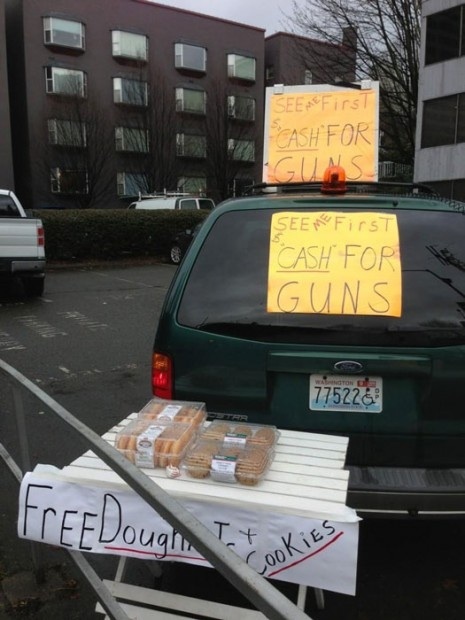 A number of private buyers set up a makeshift gun show-style event and offered cold hard cash for guns and even lured customers with donuts and cookies. “I pay cash, I don’t give Amazon gift cards,” one dealer told a gun seller. In most cases, private citizens are going home with more guns than the agency running the buyback programs. The protests, gun buyback auctions and recent gun shows all have one thing in common… lots of people creating long lines. 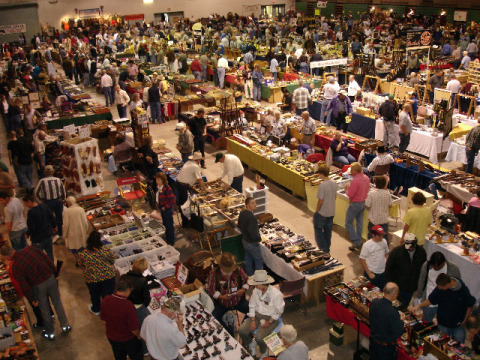 Many gun show vendors have left gun shows half way through the show due to one big problem, not enough inventory to keep the booth open. View inside a northern california gun show were thousands showed up. Watch this NBC broadcast (click on the image below) on a recent attendance surge in an Orange Country gun show which hosted 20,000 attendees. It claims that despite the long lines to get in, that there “is no ammunition available in the Los Angeles area”. This seems to be a recent trend as we spoke with a Big 5 customer “Martin” who says “I’m not really into guns, I’m trying to find ammo for my cousin in Fresno. Ammo is really hard to find there. We are trying to get it where ever we can”. Refusing to sell to law enforcement isn’t the only way that these gun companies are fighting back. Some are leaving the state entirely and taking the jobs and economies created with them. Connecticut remains the seventh-largest producer of firearms in the country, (according to federal data) and stands to lose that title when many long-standing firearms manufacturers threaten to leave the state for good. Colt, based in Connecticut since the 1800s, employs roughly 900 people in the state and is making plans to leave. In all, the industry employs about 2,000 people in Connecticut. One of the biggest firearms manufacturers in the U.S. (Beretta) announced it may leave Maryland over a proposed gun control bill being considered by lawmakers. Magpul was the first Colorado manufacturer to announce plans to leave and was quickly followed by HiViz, a company that manufacture gun sights. This list like that of firearm sales and new gun owners will continue to grow. Generally I do not read articles on blogs, however I wish to say that this write-up very informative! Thank you, such great article. I hope to see more content like this!! !